Growing up in Seattle I never really ate biscuits. My mom made tons of pancakes and waffles, but biscuits were relegated to restaurants and those were mediocre at best. Fast forward to grad school and I ended up in West Virginia and the middle of biscuit country. There is a whole chain of biscuit fast food restaurants which specializes in biscuits and biscuit sandwiches called Tudors. I quickly fell in love and was determined to learn to make southern biscuits. My first ten attempts were pretty much disasters, I could not get a hang of the idea of not overworking the dough and sadly my biscuits resembled hockey pucks. Slowly I learned to make proper biscuits thanks in large part to my mother-in-law. Everything was perfect until my husband and I went to Washington state for a visit. My husband made the mistake of ordering buckwheat biscuits and gravy at a restaurant. Really I should have warned him, but I didn't. I tried one bite of the dish and could tell they were not proper biscuits. My husband tried to be nice about the dish, but has since re-told the story to every West Virginian that he knows to explain how northerners just can't make biscuits and gravy properly. Since we are very serious about biscuits in our house I rarely try new recipes, but I am teaching my oldest son to bake so we tackled the recipe for Southern Biscuits from the Food Network this weekend for breakfast. This recipe has 7 ingredients. It takes a total of 40 minutes of time and makes 12 servings. All the ingredients are very basic and I already had all of them in my pantry cupboard and fridge. I did make a few changes, I made my biscuits larger than the recipe suggested, so I ended up with a total of 9 biscuits. My family prefers large biscuits so we can slather them in jam or gravy and the larger the surface area the better. To ensure that your biscuits turn out perfect make sure to do a few essential steps. First, make sure that the butter is very cold. I cut my butter into pieces and then place it in the freezer for approximately 5 minutes. This allows the butter to stay cold while being cut into the dough. This is essential for having fluffy biscuits. Secondly, and most important barely touch your dough after adding the buttermilk, mix the ingredients until they form a dough and no more. Very gently pat the dough into a circle and press your biscuit cutter into the dough, turn the biscuit cutter in a circle. This turning ensures that the edges will turn out perfectly in the oven. Close the door to the oven and do not open for at least ten minutes. If you open the door too soon your biscuits won't rise, so avoid the temptation. That it! I love how easy this recipe is to follow and the finished biscuits have a great taste. The recipe was so easy that my 6-year-old was able to help me with the entire recipe. The taste is slightly sweet and the buttermilk creates a great flavor. 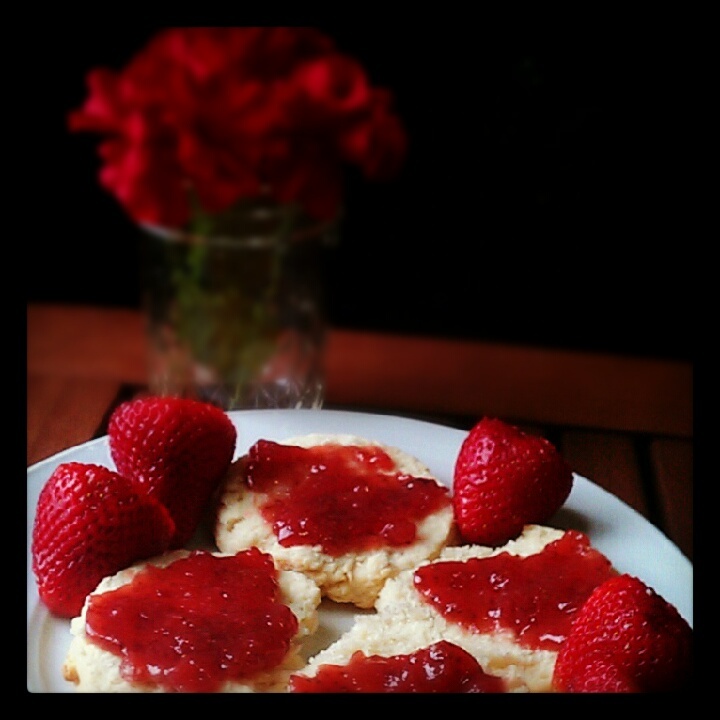 They were perfect with the homemade strawberry jam that I canned last month, yum! I will definitely make this recipe again. For the recipe go to Southern Biscuits. Visiting from Exposure 99% weekday Blog hop! Thanks for the follow, already follow you :) Come back and visit again soon! mmm...these look sooo yummy! I LOVE buttermilk biscuits! I love buttermilk biscuits also, they are delicious! Thanks for the pin :) Going to follow you back now!